Frae the tap: The Botanical Gairden o Curitiba, Curitiba skyline frae Barigui Park, Palace Avenue biggin, Paço da Liberdade, 24 Hours Street, Oscar Niemeyer Museum. Curitiba is the lairgest ceety in the sooth o Brazil, caipital ceety o Paraná state. 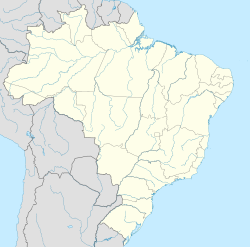 Wi an estimatit population o 1,765,000 residents athin an aurie o 430.9 km2 (166.4 sq mi), the ceety an aa lies at the centre o the hivily urbanized Greater Curitiba, wi an estimatit 3,209,980 fowk in 2010 ower 15,416.9 square kilometers (5,952 sq mi). ↑ "Curitiba in Brazil Adopts Akureyri as Sister Town". Iceland Review Online. 10 October 2013. Retrieved 10 October 2013. ↑ 2.0 2.1 2.2 2.3 2.4 2.5 2.6 2.7 "Cidades-irmãs" (in Portuguese). Câmara Municipal de Curitiba. Retrieved 22 May 2007. ↑ "Acordos de Geminação" (in Portuguese). Câmara Municipal de Coimbra. Archived frae the oreeginal on 23 January 2008. Retrieved 17 February 2008. ↑ "Sister Cities, Public Relations". Guadalajara municipal government. Archived frae the oreeginal on 2 March 2012. Retrieved 12 March 2013. ↑ "Online Directory: Florida, USA". Sister Cities International. Archived frae the oreeginal on 18 December 2007. Retrieved 17 April 2008. Wikimedia Commons haes media relatit tae Curitiba. This page wis last eeditit on 24 November 2018, at 06:26.